Want to (unofficially) end your summer with a bang? There’s plenty happening up and down the Shore this Labor Day Weekend. Hemingway’s, 612 Boulevard, Seaside Heights: Friday – Ladies Night, DJ Sooby Doobs, DJDC; Saturday – DJ Manny the Greek, DJ Milky Mike; Sunday – DJ Toro, DJ Milky Mike, $3 Coronas; Monday – The Jersey Four, Tribute to Frankie Valli & The Four Seasons, 8:30 p.m. 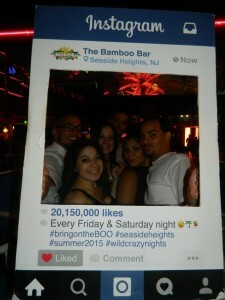 Karma, 401 Boulevard, Seaside Heights: Saturday – Karma LDW Closing Party with dance music all night. Bamboo, 201 Boulevard, Seaside Heights: Friday – ‘Rescue Fridays,’ DJ Wreck It Ralph; Saturday – Dance/EDM until 3 a.m.
Jenks, 300 Ocean Ave., Point Pleasant Beach: Friday – Whiskey Fueld, DJ Encore; Saturday – Brian Kirk and the Jirks @ 2 p.m., The Nerds, DJ Tony Gia @ 9 p.m.; Sunday – The B Street Band @ 6 p.m., DJ Unique, DJ Tony Gia, DJ Encore @ 9 p.m.; Monday – Sons of Origin @ 2 p.m.
Martell’s Tiki Bar, 308 Boardwalk, Point Pleasant Beach: Friday – New Power Soul @ 9 p.m.; Saturday – Big Bang Baby @ 9 p.m.; Sunday – Up Next @ 9 p.m.; Monday – Pat Roddy Band @ 8 p.m.